The new American regime embraces a dangerous militarism. Britain's government supports the policy at its own risk. Theresa May and Donald Trump. Stefan Rousseau/PA Wire/PA Images. All rights reserved.In her speech to senior Republicans on 26 January, the British prime minister Theresa May made it clear that large-scale interventions by the west were a thing of the past. "The days of Britain and America intervening in sovereign countries in an attempt to remake the world in our own image are over", she declared. That may be a welcome intruding of reality after fifteen years of war, hundreds of thousands of people killed, and millions displaced. The statement is also utterly misleading. 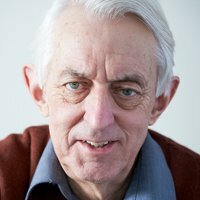 Britain is actually involved in a concentrated and sustained war in the Middle East that started two and a half years ago and shows no sign whatsoever of ending. Indeed there are clear signs that the war itself is also a stage-set for further conflict in Iraq. It will also intensify as the true nature of the Trump regime in Washington becomes plain. The main reason why the current war is getting so little coverage in the western media is that it is largely hidden from view. It is a war by remote control – using drones, strike-aircraft, special forces, private-security outfits and other means – but nonetheless a huge foreign intervention that avoids tens of thousands of "boots on the ground" and is therefore close to invisible. 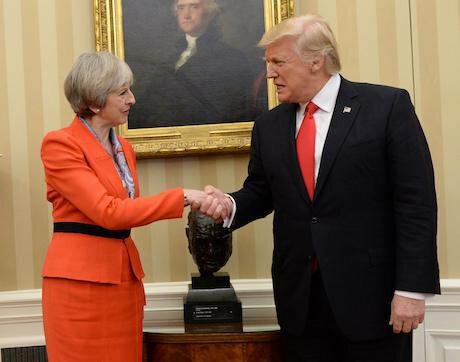 What makes the onset of the Trump regime so significant in the UK is that post-Brexit Britain needs the United States, so much so that the government of Theresa May has little option but to work closely with it. As Trump’s deep anti-Muslim stance becomes more dominant, many European governments will limit their support for him, but Theresa May cannot do that and must stay faithful. Some will argue that most of what Trump says about Islam and ISIS is mere rhetoric. But there is now abundant evidence, not least in his recent appointments, that Trump will rapidly expand the war against ISIS. Indeed, one of his first actions was to agree a major special-forces raid in Yemen. There will be much more in this vein. His administration may also be behind this week’s decision to supply Kurdish fighters with armoured vehicles to support their fight against ISIS in northern Syria. Trump has also made it explicit that there will be a major rise in military spending, albeit this will have to be achieved by deficit funding. His administration has accused Iran of "malign actions" and put it "on notice". Even more significant is the manner in which the National Security Council is being refigured to focus very much on a hard-right agenda, with Trump's senior adviser Steve Bannon appointed a member – while the chair of the joint chiefs-of-staff and the director of national intelligence will no longer attend as of right. As the war against ISIS and other Islamist paramilitary movement expands, this raises the question of why an already high-level war gets so little coverage in the UK. It is a key question because any lack of public debate means that it is even easier for the May government to stay close to Trump. The main reason is the nature of that war – very much conducted below the western media horizon, if repeatedly publicised by Islamist propagandists to great effect as a protracted war against Islam as a whole. The orthodox western media have few in the way of journalists covering it, and in any case getting close to where the war is being fought is too perilous for westerners. In Britain there are valuable sources of information, including openDemocracy and the very few think-tanks and non-government groups actively probing what is going on. On the casualty-counting side, Iraq Body Count is resolute in its tracking, and the wider Every Casualty organisation is extending this work. In terms of the air war in Iraq and Syria, the diligent and very well informed Airwars has to some extent succeeded in getting its voice heard. It is, for example, currently recording a surge in civilian deaths in the past three months. In trying to bring together the much wider move towards “under the radar” warfare, the Remote Control Project is doing the most. Its most recent outputs are especially telling for UK policy in the nascent Trump era. Limited Accountability is a transparency audit of the degree of openness of the thirteen coalition partners in the air-war against ISIS, written for the project by the Airwars team. On the air-war part of the coalition’s actions, the report finds the UK quite open, although its assessment of civilian casualties simply does not fit in with other data. The government claims that there has not been a single civilian killed after more than a thousand airstrikes. Airwars reports a minimum estimate of 2,326 civilians killed in 17,726 air-strikes by the coalition as a whole, so the British claim is either nonsensical or the RAF has achieved a level of precision that is unparalleled in the history of modern warfare. Where the UK certainly fails is in its persistent refusal to provide even the most cursory information about the use of special forces, an area explored also by the Remote Control Project. Britain’s culture of secrecy underlies this approach. Even though the UK's special forces have been active right across the Middle East and north Africa, and well into sub-Saharan Africa, there is simply no parliamentary scrutiny of their actions. UK officialdom relentlessly refuses to impart even basic information, a "no comment" environment that allows little or no space for democratic acountability. The Trump administration's pursuit of a war across the Middle East risks escalating into a more general war against Islam. A British government that collaborates in this policy would incur even greater risks than it currently faces. That makes inquiry and criticism now all the more vital.